As we walked towards our cabin on Hualapai Ranch, the setting sun lit up the Grand Canyon with shades of bright pinks, purples and reds. We couldn’t have imagined a more perfect way to start off our adventures at Grand Canyon West. 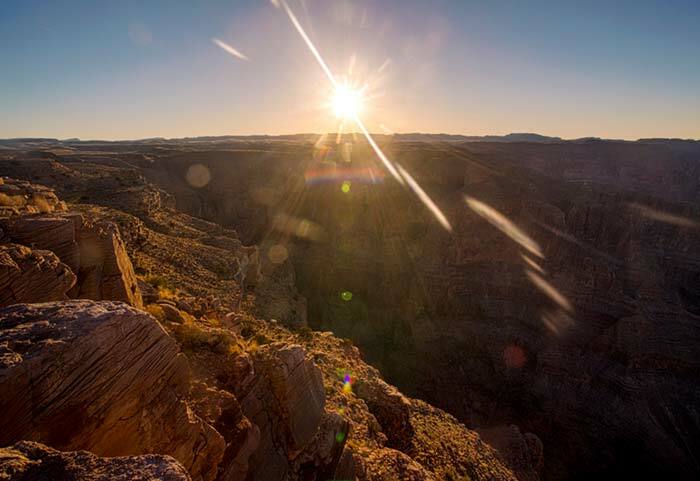 One of our favorite aspects of the Grand Canyon is how different the light can make the canyon appear throughout the day. Your views are never the same, even when gazing upon the same rock formations. We made our way to cabin #9 and settled in for our two-night stay. The room was simple but cozy, with a queen size bed, couch, bathroom and a porch with chairs right outside the front door. As darkness fell over the ranch, we went out for some stargazing and a bonfire complete with s’mores. While we watched the flames crackle, we listened to stories told by one of the staff members about the Hualapai tribe and their lands. Campfires are a great way to mingle, and that’s exactly what we did—we had a great time chatting with our new friends and fellow guests at Hualapai Ranch. So much so that we fueled the conversation with coffee and tea (which is included and unlimited with every overnight stay). Eventually it was time for bed—we had a big day ahead of us. To get our day off to a great start, we enjoyed our complementary breakfast at the on-site restaurant. We were regaled with eggs, pancakes, biscuits with gravy, bacon, sausage and toast. It was the ideal and delicious way to fuel up for our day. First up that morning was a 30-minute horseback ride to the edge of the Grand Canyon. We followed our guide and rode down the trail towards the Grand Canyon. Once we got close to the edge, the views were incredible. What a way to start the day! As we raced down the lines, we were able to see views of the canyon below us and in the distance; the farther down the line we traveled, the deeper the canyon became. Next, we were fitted for harnesses because it was time for another adventure: zip lining! Once we were outfitted with harnesses, we jumped in a cart and drove back towards the canyon. 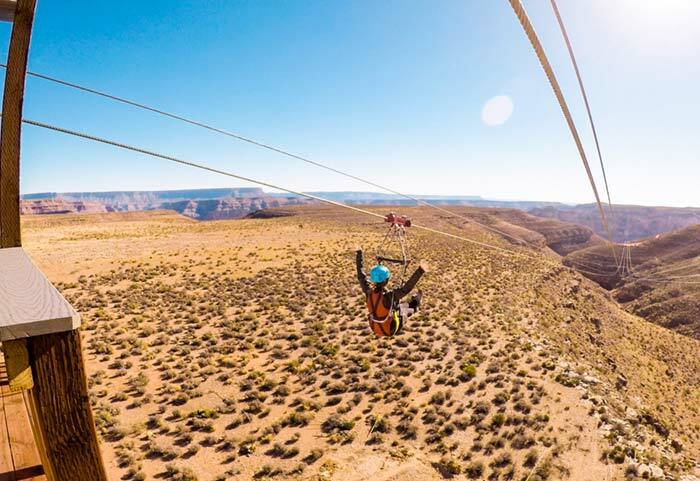 The two zip line runs send you soaring almost 1,000 feet over a spectacular side canyon at speeds close to 50 mph. We were flying so fast that our hearts were practically jumping out of our chests and we screamed with delight the entire ride. As we raced down the lines, we were able to see views of the canyon below us and in the distance; the farther down the line we traveled, the deeper the canyon became. Towards the end of the second line, we even spotted views of the river winding below! It was an exhilarating experience and the scenery was fantastic. Back at the ranch, we caught the gun show full of bank robbers and sheriffs before heading over to the Shootin’ Gallery. 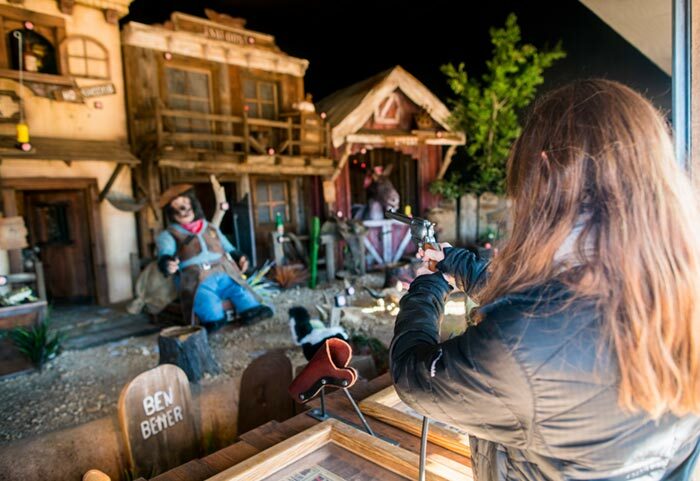 We picked up our laser rifles and aimed at the targets next to the animatronic critters and scenes in front of us. Each time we hit a target, we were entertained with a cute little show, so we had some fun motivation. It was barely noon and we had already participated in several awesome adventures, so the next item on the agenda was quite welcome. We made our way to the Sa' Nyu Wa restaurant for lunch with fantastic views of the Skywalk and the West Rim of the Grand Canyon. We ordered Hualapai Tacos and a French Dip, and we were able to sample a variety of other delicious dishes, such as the fry bread, quail, calamari and more! After filling our bellies, it was time to test our fear of heights by heading out on the Skywalk at Eagle Point. 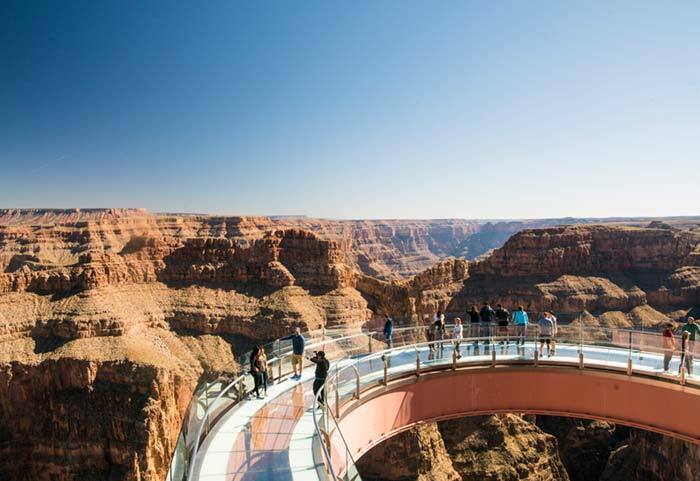 The Skywalk is essentially a glass bottom bridge that curves out in a horseshoe shape over the Grand Canyon. The bottom of the canyon sits 4,000 feet below the glass; needless to say, it’s a long way down. We had the photographer snap a few photos of us while we were on it to commemorate the experience. We eventually pulled ourselves away for the rest of the activities we had in store for the day. We then walked around the Native American Village to explore some of the traditions and heritage of the local tribe. 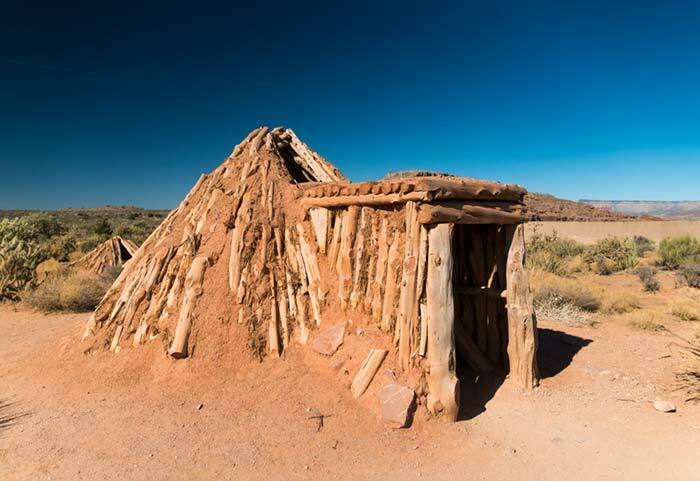 It was so interesting to see the sweat lodges, ovens and traditional dwellings, such as the wikiup. It gave us some great insight into the area’s native culture. Then, it was time for a hike at Guano Point. The smooth-path hike is relatively short, but there’s an option to scramble up and around the rocks for a view with extra impact. We decided to go the rocky route and once again, we were amazed by what we saw. From every angle, the Grand Canyon is truly an awesome sight. Once again the rocks of the canyon were glowing with spectacular colors as the sun started to set. Our motto quickly became “just one more photo” as we tried to pull ourselves away from the scenery for the night. Back at Hualapai Ranch we bellied up to the root beer saloon and ordered a root beer float to share before heading towards the canyon to finish watching the sunset. Then it was time for dinner at the ranch restaurant. Consisting of meat, two sides, cornbread and cookies, it was filling and incredibly tasty. After a relaxing evening full of peace and quiet, we collapsed into bed, exhausted from a day well spent. Each participant stands on either side of a Plexiglas barrier and once the cowboy shouts “go”, they aim at their opponent and shoot. To wind down our time at Grand Canyon West, we grabbed breakfast the following morning and then went outside for a quick draw shootout. Historically, two people each take 10 paces then turn around and shoot at each other. For a modern update suited to leisure visitors, there’s no pacing involved in this shootout. A resident cowboy gives guests a quick rundown on how things work. Each participant stands on either side of a Plexiglas barrier and once the cowboy shouts “go”, they aim at their opponent and shoot. Thankfully the barrier takes the “bullet” and not your opponent. The cowboy judges and the quickest shooter wins! A bit of good old “Wild Wild West” fun was quite the way to end an amazing visit to the Grand Canyon. We had a wonderful time soaking up the beautiful scenery and adventures at Grand Canyon West, and we hope to return again sometime very soon! Purchase tickets for your Grand Canyon West adventure.